It has been requested that the title of this article be changed to List of governors of Nevada. Please see the relevant discussion on the discussion page. The page should not be moved unless the discussion is closed; summarizing the consensus achieved in support of the move. The Governor of Nevada is the chief magistrate of the U.S. state of Nevada, the head of the executive department of Nevada's state government and the commander-in-chief of the state's military forces. The governor has a duty to enforce state laws, and the power to either approve or veto bills passed by the Nevada Legislature, to convene the legislature at any time, and, except in cases of treason or impeachment, to grant pardons and reprieves. The Governor serves a four-year term. He is limited to two terms, even if they are non-consecutive. If a person ascends to the governorship and serves more than two years of a previous governor's term, he is only eligible to run for one full term. Candidates for Governor must be at least 25 years old, and must have been citizens of Nevada for at least two years, at the time of election. The Lieutenant Governor of Nevada is not elected on the same ticket as the Governor. 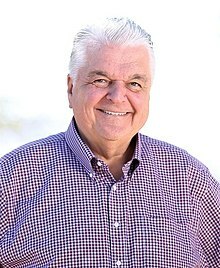 The current governor is Democrat Steve Sisolak, who took office on January 7, 2019. The first provisional governor of the proposed Territory of Nevada was Whig Isaac Roop, who was elected in September 1859 and took office on December 15 of that year in Genoa. When the territory was incorporated on March 2, 1861, Republican James W. Nye was appointed Territorial Governor by President Abraham Lincoln and served until statehood in 1864. Mark Twain's brother Orion Clemens served as Territorial Secretary to Nye. Nevada became a state on October 31, 1864, and Nye remained acting governor until the first governor, Henry G. Blasdel, took office on December 5, 1864. There have been 29 Governors of Nevada, eight of whom were actually born within state boundaries. The longest-serving Nevada Governor was Bob Miller, who served two and a half terms from 1989 to 1999. The shortest-serving Nevada Governor was Acting Governor Frank Bell, who served the remaining four months of Charles C. Stevenson's term upon the governor's death. The current governor is Steve Sisolak, who took office on January 7, 2019. Prior to becoming a territory, parts of Nevada were part of Utah Territory and New Mexico Territory; see List of Governors of Utah and List of Governors of New Mexico. ^ a b c d e f Died in office. ^ a b c As lieutenant governor, acted as governor for unexpired term. ^ a b As Nevada Lieutenant Governor, acted as Governor for unexpired term, and was later elected in his own right. ^ Resigned after being elected to the United States Senate. This is a table of congressional and other offices held by governors. All representatives and senators mentioned represented Nevada. * denotes those offices which the governor resigned to take. ^ "CSG Releases 2015 Governor Salaries". The Council of State Governments. June 25, 2013. Retrieved November 23, 2014. ^ NV Const. art. V, § 7. ^ NV Const. art. IV, § 35. ^ NV Const. art. V, § 9. ^ NV Const. art. V, § 13. ^ NV Const. art. V, § 2. ^ NV Const. art. V, § 3. ^ Bruce, A. T. (October 16, 1937). "An Editorial Estimate Seventy Years Ago 1886". Lassen Advocate. Retrieved November 16, 2010. ^ "1962 General Election Returns". Nevada Secretary of State. Archived from the original on July 3, 2014. Retrieved December 30, 2014. ^ "1966 General Election Returns". Nevada Secretary of State. Archived from the original on July 3, 2014. Retrieved December 30, 2014. ^ "1970 General Election Returns". Nevada Secretary of State. Archived from the original on July 3, 2014. Retrieved December 30, 2014. ^ "1974 General Election Returns". Nevada Secretary of State. Archived from the original on July 3, 2014. Retrieved December 29, 2014. ^ "1978 General Election Returns". Nevada Secretary of State. Archived from the original on July 3, 2014. Retrieved December 29, 2014. ^ "1982 General Election Returns". Nevada Secretary of State. Archived from the original on July 3, 2014. Retrieved December 29, 2014. ^ "1986 General Election Returns". Nevada Secretary of State. Archived from the original on July 3, 2014. Retrieved December 29, 2014. ^ "1990 General Election Returns". Nevada Secretary of State. Archived from the original on July 3, 2014. Retrieved December 29, 2014. ^ "1994 General Election Returns". Nevada Secretary of State. Archived from the original on July 3, 2014. Retrieved December 29, 2014. ^ "1998 Official General Election Returns". Nevada Secretary of State. Archived from the original on June 21, 2012. Retrieved December 29, 2014. ^ "Elections Results: Official 2002 General Election Results". Retrieved April 2, 2013. ^ "nvsos.gov". nvsos.gov. September 8, 2006. Retrieved April 2, 2013. ^ "2010 Unofficial Statewide General Election Coverage and Reports". Nvsos.gov. November 2, 2010. Retrieved April 2, 2013. ^ "OFFICIAL RESULTS 2014 Statewide Results". Nevada Secretary of State. Retrieved December 24, 2014. "[archive.org/web/20090906035749/https://web.archive.org/web/20090906035749/http://gov.state.nv.us/ Governor Jim Gibbons]." State of Nevada. Retrieved September 7, 2009. "[archive.org/web/20090912133456/https://web.archive.org/web/20090912133456/http://www.nga.org/portal/site/nga/menuitem.8fd3d12ab65b304f8a278110501010a0?submit=Submit&State=NV Governors of Nevada]." National Governors Association. Retrieved September 7, 2009. "Nevada Governors' Biographical Information." Nevada State Library and Archives. Retrieved September 7, 2009. "Territorial Officers[dead link]." Nevada State Library and Archives. Retrieved September 7, 2009. "[archive.org/web/20100608191224/https://web.archive.org/web/20160304092333/http://www.leg.state.nv.us/lcb/research/selectedofficersnvlegislature.pdf Selected Officers of the Nevada Legislature]." Nevada Legislature. Retrieved September 7, 2009. "The Constitution of the State of Nevada" (1864). Nevada Legislature. Retrieved September 7, 2009. This page was last edited on 11 April 2019, at 14:31 (UTC).